With this omnitester, you can test the resistance of atomizers, clearomizers and the voltage of batteries. The are two threaded ports on the tester. The left one is for testing the resistance of atomizers and clearomizers. The right one is for testing the voltage of battery. Screw Atomizer, clearomizer or battery (510/eGo threading) on the threaded ports directly, no adapter is needed. The Omnitester will display a 1 in the first digit to the left if there is no current flow from battery to the tester. Resistance testing - move the button on the omnitester to left side, resistance will show on the screen. 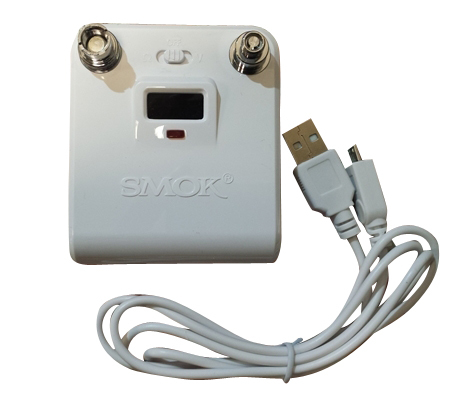 Voltage testing - move the button on the omnitester to right side, then press the button on the battery and the voltage will appear on the screen. 3.Move the button back to the middle, turn off the Omnitester. The Omnitester has a built in battery and is recharged using the supplied micro USB cable. One USB cable comes with the omnitester. When charging, the light on omnitester will turn red. When fully charged, the light will be off. The test amperage is a mere 3 milliamps to prevent any damage to the coils in the items being tested.